Zurich Ragout, or Zürcher Geschnetzeltes in German, is known as Züri-Gschnätzlets (Zsur-ē-Gshnetz-lets) in Swiss German dialect. 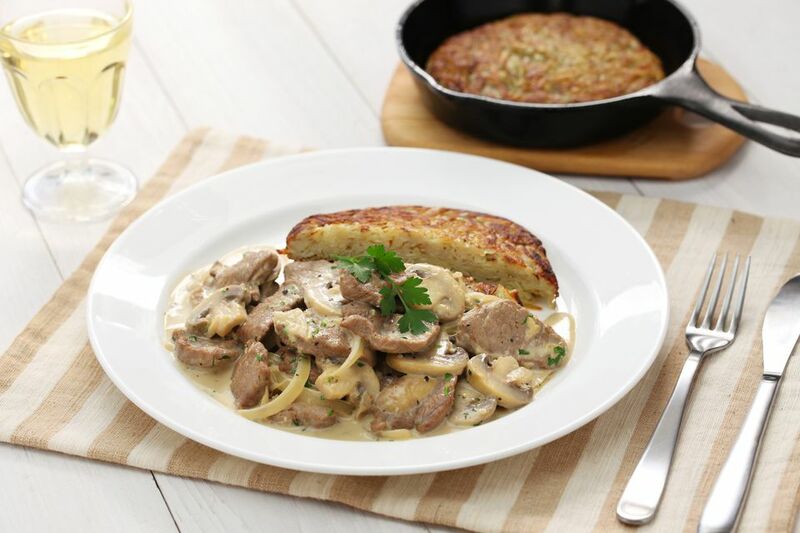 This simple ragout or stew recipe in a white sauce is made with mushrooms and white wine. It contains many of the typical Germanic flavorings, including parsley and lemon zest, a recent addition to German cuisine. Delicate, but quick to make, this dish may find its way into your heart through your stomach. Veal loin is traditionally used but pork loin may be substituted. It is traditionally served with Rösti (Swiss Hash Browns) and a white, Swiss wine (or try a Pinot Grigio or Grüner Veltliner). Melt 1 tablespoon clarified butter over high heat and quickly brown meat strips until they're no longer pink. Remove from pan and keep warm. Add 1 more tablespoon of clarified butter, if necessary, to the pan and stir in 2 minced shallots. Cook for 2 minutes, then add the 2 cups thinly sliced (or even shaved) mushrooms to pan and cook until soft and brown. Sprinkle mushrooms with 1 tablespoon flour and stir. Cook for 1 minute. While stirring, slowly add the 1 cup dry white wine and 1 cup beef broth to the mixture. Bring to a boil and cook until sauce is reduced by half. Stir in the 1 teaspoon lemon zest, 1/4 cup cream, and salt and pepper to taste. Add the browned meat back to the pan and warm, but do not cook the sauce any longer. Serve with the 2 tablespoons chopped parsley sprinkled on top. This dish is traditionally made with veal loin and veal kidney, but you may also use pork loin or chicken with this sauce.